When it comes to being social, it seems that people are steering more toward getting together outside of the home rather than hosting great friends and family inside of the home. Well today my friend, we encourage you to bring back the dinner party! Why take the time to beautify and decorate your home, only for no one to see it? Welcome your friends into your home for a night of fun, food, and conversation. My friend Emily Allen of Dinner Party Atelier is here to show us just how she’s bringing back the tradition of dinner parties! Emily invites us into her home to see how she and her best girlfriends enjoyed a night of dinner and fun together at home recently. She’s an expert of sorts when it comes to dinner parties so I’ll let her tell you all about it. I am honored to be featured on Interiors by Jacquin and excited to share a recent dinner party that I hosted for some of my friends. After cooking and entertaining, interior design is another passion of mine that follows close behind. I believe one’s décor is an essential element that defines what styles of entertaining you can accommodate in your space. 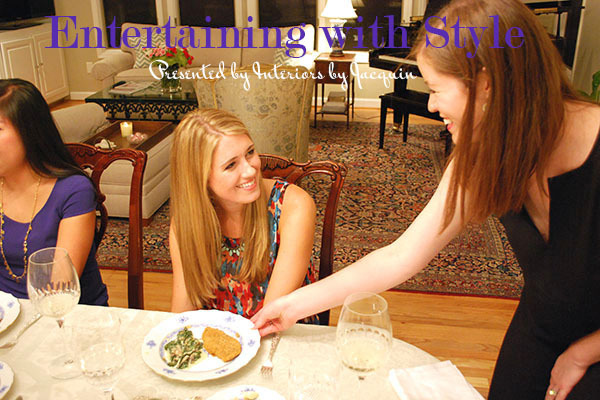 Entertaining at home around the dining room table is quickly becoming a lost art. The mission of my website Dinner Part Atelier is to inspire those who enjoy good food and great friendships to bring back the dinner party! Those moments spent sitting around a candlelit dinner table, laughing until we cry and relishing a good glass of wine beats any dinner out at a restaurant, and without interruptions from waiters and strangers sitting within earshot. Hosting a dinner at home is authentic, intimate, and a gift you give to those who attend. Today I’m sharing with you three easy tips for hosting a stress-free dinner party any night of the week! 1. Begin the evening with a special signature cocktail, and place the drinks and napkins right where you want everyone to start. When the girls walk in, I like to have glasses of champagne waiting for them in the living room. This gives an immediate visual cue of where guests should congregate to chat while I’m finishing up dinner in the kitchen. Because my kitchen opens up to both the dining room and living room, I am still able to participate in the conversation. Consider the flow of your own house and use that as a guide to decide where you want any pre-dinner cocktails and conversation to occur. 2. Be creative with the table décor. A formal dinner does not have to look stuffy and dated. When I set the table for this dinner party, I wanted to have a fresh, modern tablescape to balance the formality of the china and crystal. In lieu of a flower arrangement and tall candlesticks, I created individual succulent centerpieces that I clustered along the center of the table. I placed small, simple candles around the succulents to give off a glow without competing visually with the succulents or the pattern of the china. 3. Plan your menu carefully, taking into consideration the prep time for each dish. I try to only have one dish that needs to be prepared immediately before the party. In this case, it was the creamed spinach and mushrooms. I did everything I could ahead of time – diced onions the night before, sautéed mushrooms and onions in butter in advance – and by the time guests arrived all I had to do was heat the mushrooms back up, toss in the pre-washed spinach and cream, and stir in a little parmesan cheese. The salads were plated in advance, the coffee for the dessert was brewed just before guests arrived, and the main dish was a make-ahead freezer recipe that I just had to defrost and heat up. How easy is that? Emily’s girls’ night dinner party looks like it was a fantastic time! Hoping you’re feeling inspired to host a fun dinner party of your own. Emily has plenty more dinner party ideas to share with you on her website Dinner Party Atelier. Stop by to see the latest! Before I end this post for today, I have two bonuses for you! The recipe for Emily’s dessert, Lemon Whipped Cream with Fresh Blueberries, along with an old photo of Emily and I from college. We studied abroad together in London through Vanderbilt years ago! 1. Juice and zest the lemon. Set aside zest. 2. Using a stand mixer and whisk attachment, combine lemon juice, cream, and sugar. Mix on high until stiff peaks form and you have lemon whipped cream. 3. Divide whipped cream into 6 bowls. Top each with ½ cup blueberries. Garnish each with a cookie and lemon zest and serve immediately. Serves 6. If you’re thinking about how fun it would be to have your favorite friends over for a chic dinner party, go for it! Don’t forget to head over to Dinner Party Atelier before you do. Emily has so many great dinner party tips and ideas! Thanks for reading!